Transforming Hollie: Ten weeks... Still holding strong! Ten weeks... Still holding strong! It's hard to believe that tomorrow marks 10 weeks since I went sugar/flour/wheat free. Every time I pass on dessert, or pizza, or pasta, I'm amazed that I'm able to say 'no' so effortlessly. Rolls at the dinner table? No problem! Tummy treats at BUNCO? Not for me! I am able to appreciate how good these treats must taste without indulging. It's just not worth the risk of un-doing all the hard work I've put in. As of yesterday, I'm down almost 33 lbs. the weight is still coming off slow, but I've learned to just appreciate the fact it's coming off at all. I'm trying to eat more calories, and most days I do ok. But some days I'm still pretty low. Still working on that. I've had to work on a recent craving for potato chips, which I've never had an issue with before. And Coke Zero. I only drink water, but I love Coke Zero and have been giving in more lately. I guess the bottom line is I'm still trying to get a hold on my disordered eating... And it's not all about sugar. It's a mind thing. Totally. But I've been successful for 10 weeks, and I don't plan in quitting anytime soon! Ooh girl! You're looking absolutely fab, congrats on your success!!! I want to first congratulate you on your success. Not only and I a Sport and Exercise Psychology Consultant, but I too just completed a 3 month cleanse - no sugar, no dairy, no gluten, etc. Sticking to your plan is all about having the right mindset. I applaud you for your efforts, your success and I thank you for sharing your story:-). Hello Again, http://www.zuup.com/ here, I hope you don't mind, I will keep on coming back because I really love your blog here. 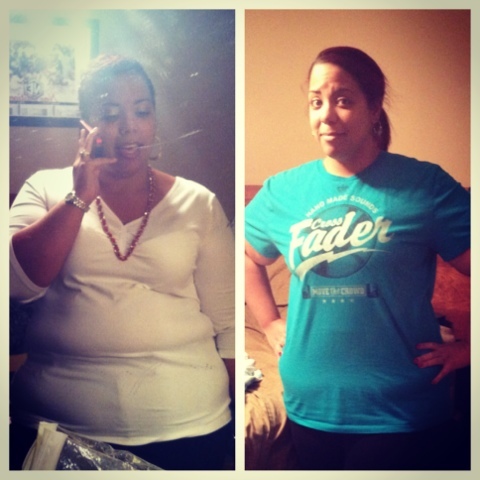 Hollie, I hope those photos are your 10-week before and afters, because you look fantastic! You need to pin those up somewhere as confirmation this is working for you! Wow Hollie thats great! I think I could go a while with no sugar but no pasta would kill me haha. Keep strong! I just started my own weight loss blog, maybe you could check it out sometime! Hey Hollie, you are looking good, girl! Congrats on the 10 week benchmark - that is awesome. I've found that everything ELSE tastes so much better now that it isn't covered up by the wheat/sugar taste. Fruit tastes like candy! Definitely can see the results ! You look fab as usual! I'd love to have the willpower to eliminate what you have from my diet, but for me that's difficult. I know I'd feel a lot better if I eliminated just bread, but again I'm not there yet. Maybe soon? Keep going, you're doing great. u look amazing! I'm trying to get to where u are. I did 4 days straight but havent been able to kick the habit just yet! :) Keep it up! Awesome job! You look amazing! Your before and after is similar to mine! Check out my blog at swisscupcakes.blogspot.com. Congrats again! You look fantastic! What a difference. Being "sugar free" rocks!! Good job. Those are nice pics. Wow! Looking great, keep it up Hollie! You go girl! It must have been hard but I can see that with self discipline you'll definitely see the results and I think it's worth it. I'm Kateri Von Steal, and I am one of your newest "followers"... stalkers, I guess is a better word. I am constantly going up and down the scale as well... I've gone back "on" the proverbial healthy wagon..
Found your blog for encouragement. Hi! New to your blog. You are doing great! Isn't it great how giving up the sugar and flour ends 95% of all cravings for them, after the first 4 days or so? Good job! You can really tell the difference! Keep it up! Whenever I get discouraged about how slow my weight loss is going I try to remember how far I've come since I started instead of how far I have left to go. It always helps put it in perspective. Hey girl! Your progress is amazing.. Wondering what's a typical day look like for you eating-wise? Thanks for posting! You are so inspirational! So proud of you! You're so strong! Holly, you look wonderful. I guess we all have struggles and have to overcome them, you seem to want it so you will get it!! I will be back, I am trying to lose my weight also and I need all the inspiration I can get!! I love this post. I am a food addict so I completely understand where you are coming from. Woah, I wish I could say no to pizzas and pasta like you do! I can hardly say no to them. Congratulations, it's really not easy giving up on things we love especially food! Keep it up!